For the supporters of autopathy: We invite you to visit our stall at the Paracelsus Fair in Düsseldorf, Germany, on 16. – 18. 10. 2015. Our team, led by Jiri Cehovsky, author of books about this method and its founder, will be there to provide detailed information, to answer your questions and to help you access everything, which is necessary for autopathic healing. 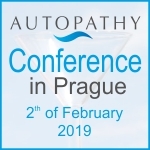 In the frame of the lecture programme organised by the fair, Jiri Cehovsky will speak (in English with German translation) about autopathy in professional praxis and in self-healing of chronic disorders. The lecture will take place on the 17th of October, at 16:30.